While it lacks the more advanced fitness tracking of the Elite Sport earbuds, the Jabra Elite Active 65t appear to strike a decent balance between features and price, while including the same great sound quality we’ve come to expect from Jabra’s true wireless efforts. One area where true wireless earbuds make the most sense is when you’re exercising. That little wire that usually connects the two earbuds might not get in the way much with everyday use, but it sure can get annoying when it’s tapping rythmically on the back of your neck while you’re running. Jabra is no stranger to this trend. Its Jabra Elite Sport earbuds contain a whole host of features designed for fitness use such as heart rate and step tracking. The new Jabra Elite Active 65t is the $190 (around £140 / AU$240) middle sibling in Jabra’s true wireless family. It doesn’t have the heart rate tracking of the Elite Sport, but it’s got an accelerometer for tracking your steps, which is missing from the cheaper Elite 65t. So are the new earbuds in the Goldilocks zone, or are they the unloved middle child? We gave them a listen on the show floor of CES 2018. While some other companies are still struggling to make their true wireless earbuds nice and slimline, Jabra appears to have solved this problem long ago. The earbuds aren’t particularly small, but when you wear them they manage to fit what bulk they have neatly within your ear, meaning that they don’t end up protruding too much. On the left is a single multi-function button that handles playing and pausing duties, while on the right the button handles volume and track-skipping duties. It’s this right button that you can also use to access a voice assistant. By default this will access your phone’s built-in voice assistant, but the Jabra Elite Active 65t also packs in support for Amazon’s voice assistant if that’s more to your liking. You can choose between voice assistants using Jabra’s app, which also includes other handy options such as allowing you to fine tune the EQ settings of the earbuds, and even choosing how much of the outside world to pass through the earbuds. With voice assistants in headphones, it's important that the device's microphones are up to the job of picking up the sounds of your voice. To hear your spoken commands, the Jabra earphones utilise the same technology that's used to isolate your voice when you make calls. Although Amazon’s Alexa is the only logo on the box, a representative from Jabra told us that the company will be seeking to have the earphones Google Assistant-certified when Google fully opens its certification process. Sound quality is very respectable. Tracks we were able to listen to had good definition and clarity, and passive noise isolation was decent. 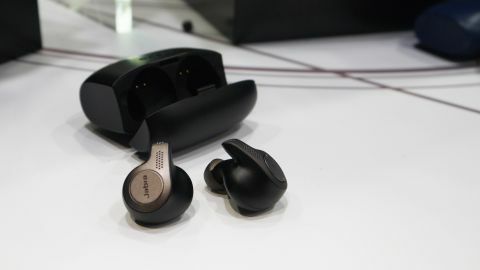 Our one reservation was that the (prototype) earbuds had a little bit of trouble maintaining a connection on the show floor (which admittedly, probably has some of the highest amounts of radio interference on the planet). Battery life is a reasonable five hours, with a charging case providing two additional charges. The earbuds are rated to IP56, which means they should be able to withstand any sweat from a workout. Without having been able to test the step-counting functionality of the headphones, it’s difficult to know whether they’re as capable a pair of fitness ‘buds as their bigger brothers. But what we did experience was positive. The fit is good, the app functionality is wide-ranging, and Alexa is a great addition.